Cereal is one of the most preferred options for breakfast; it takes no time to prepare, goes down easily and if it is produced from the right grains and ingredients it renders a lot of energy throughout the day. As consumers are becoming more health conscious, they demand organic cereals which are produced from totally natural and organic foodstuffs and which consequently taste fresh and not like the packaging they were inside. To meet the consumers’ demands, many organic cereals have been launched by different manufacturers and if you look closely in the cereal aisle, you might just be able to locate some of the best organic cereals in your favourite shopping zone. Since there are many companies who claim their own cereals to be “best organic cereals” when they are not, consumers have lost the trust in their choice. We have therefore lined up some of the best organic cereals for you some of which might be locally available to you whereas you might have to order other organic cereals from nearby cities or towns. 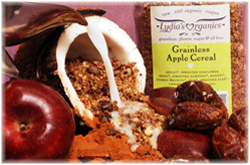 The Grainless Apple Cereal by Lydia’s Organics is certainly one of the unusual cereals besides being one of the best organic cereals that is full of nutritious elements, making it perfect for breakfast. Amongst her other grainless cereals, this is perhaps the most popular produced from 100% organic raw apples, sprouted almonds, walnuts, raisins, figs, sunflower seeds and of course a hint of cinnamon to give that extra spicy flavour. With each of her organic cereals she has made a suggestion of the perfect liquid to make it a complete meal. This is undoubtedly another one of the best organic cereals which come packed with flavours and nutrition. Instead of flakes, you are going to find inside mini whole wheat biscuits that contain 20% of the required daily fibre. It also provides 6 grams of protein and a total of 180 calories. Top it off with organic milk for a completely healthy breakfast. 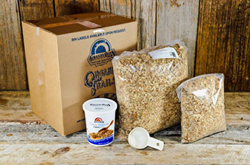 Grandy Oats is also another famous brand which provides authentic and best organic cereals. Have a typical Swiss breakfast with this kind of cereal that is full of organic oats, hazelnuts, date, almonds, raisins and Vitamin C rich apple pieces. The cereal is also reinforced by sunflower seeds. The GI count of this cereal is pretty low giving you the appropriate nutrition in the morning. It goes best with Greek yogurt; you can however have it with milk. Cascadian Farm has been around for many decades now and is really famous for its best cereals. The Farm Honey Nut O’s is an organic cereal containing only 1% fat, 25 grams of carbohydrates and 2 grams of protein making it the best breakfast choice. General Mills is a really famous cereal brand that offers a huge variety of cereals including Farm Fruit & Nut Granola, Farm Flax Right, Pomegranate Raspberry Clusters etc. Try this unique organic cereal for breakfast boosting your body’s cardiovascular performance. 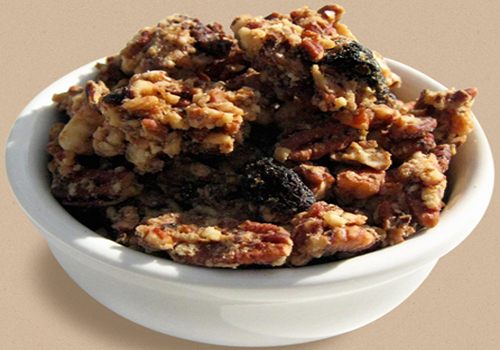 This cereal contains dried berries mixed with organic coconut oil and other grains. You can eat it as it is or mix it with milk or yogurt.